Sunshine I have worn these shorts for several years now. Recently, I lost weight and had to buy new ones. The quality is the same as the old, which is a rare thing today! I find them to be the most comfortable shorts to wear when exercising and just hanging around the house. I buy at least 7 of them so I can slip on a clean pair every day. After years of use, only a few of my old ones had lost their stretch in the elastic waistband. Other than that, these are perfect for me! They are in my opinion; easy to to wear crazy comfortable, and wash well. There may be slight color fade after may washes, but that holds true for many products not just softies. I am extremely pleased with the product, and will buy them again. in the middle Soffe products are great. They are just what you need at a great price. No frills, no names, but good basics that are easy to wear. Sometimes when you are working out, getting all sweaty, you just want comfortable clothes that do the job without being flashy. Soffe products wear well and wash well. Good fabric, good elastic, good colors. I also love that there are kids sizes, adult sizes, and that in between size that is so hard to fit and find- juniors. My only complaint is that the stores need to designate the areas better for these size differences. Char the runner Soffe products are great. They are just what you need at a great price. No frills, no names, but good basics that are easy to wear. Sometimes when you are working out, getting all sweaty, you just want comfortable clothes that do the job without being flashy. Soffe products wear well and wash well. Good fabric, good elastic, good colors. I also love that there are kids sizes, adult sizes, and that in between size that is so hard to fit and find- juniors. My only complaint is that the stores need to designate the areas better for these size differences. Jennifer This is a tried and true product that I have used for years. I like the design, size & fit. Great for around the house lounging, sleeping, and sports activities. Dries quickly when wet. Sure wish they still made the Soffe retro shorts. Those were even better. None I have used these shorts for years because of its comfort and long-lasting durability. I believe Sports Authority is the only retail store in Hawaii that carries this particular brand of shorts and I appreciate that it not only continues to carry that line of shorts but also still keeps it at an affordable price. I will continue to purchase these shorts as long as I can get them for such a reasonable cost. Ms J We have a 21 girl squad and no matter whether we needed child or adult sizes, color and fit were the same. We had the best outfits at homecoming! Go!!! Fight!!! Win!!! Potato Great comfortable shorts. Loved the colors and they were at a great price. The darker colors fade after many washes, but for the price, it is a good bargain. 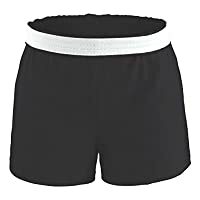 Volleyball Hustler Soffe shorts aren't too short or long. They're the perfect length that can be shortened if desired. They're stylish and comfortable and a great price.